Hurricanes may not strike Tampa, Florida very often, but that doesn’t mean you can don’t need window and door protection for your home or business. Hurricanes aren’t the only thing that can break or damage your windows and leave you dealing with expensive repairs. While you should always be prepared for the event of a hurricane strike in your area, tornadoes and other storms also require window protection and safety precautions. And with the added threat of vandalism — after a storm or at any given time — having reliable window protection in place just makes sense. Equipping your windows and doors with strong accordion shutters in Tampa, Florida from Empire Construction & Development is one of the best ways you can protect your home or business. Why Accordion shutters? Accordion shutters are our most popular storm protection product at Empire Construction & Development, and they’re popular for some good reasons. First of all, they work – when you need them, every time you need them. A combination of durability and ease-of-use means you can quickly secure your windows and doors. 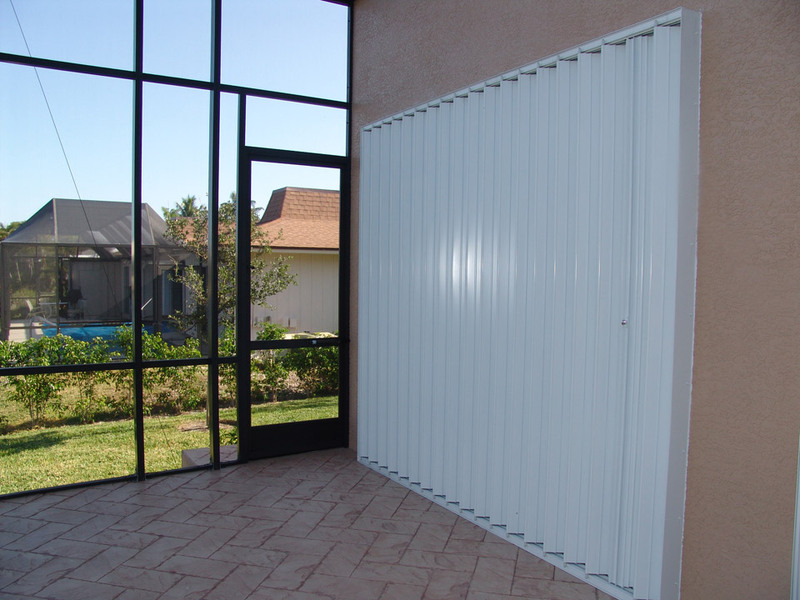 They’re also versatile – our affordable accordion shutters in Tampa, Florida can be used on some or all of your windows and doors for everyday security and when the weather calls for them. And since these shutters are custom-made to your specifications, you know you’ll get precise and effective window and door coverage, without any gaps or unnecessary bulk on your building. Cover all of your bases. If you already have storm protection on your home, great – but don’t forget about your business. Aluminum accordion shutters in Tampa, Florida from Empire Construction & Development can be used on office buildings, restaurants, storefronts, warehouses, and other commercial buildings as well as on homes. And if you want to upgrade your existing storm protection, accordion shutters from Empire Construction & Development are a great choice. Any condition that can stir up debris and create flying projectiles is a threat to your windows, glass doors, and the structural integrity of your building. When you buy accordion shutters in Tampa, Florida from HurricaneShuttersFlorida.com, it’ll be easy to protect your business or home from all kinds of weather, vandalism, and any other threat to your windows and doors. What we do – At Empire Construction & Development, we make shutters you can count on. Our accordion hurricane and security shutters are custom-built for our customers throughout Florida and the US. To get a free price quote on your accordion shutter order, contact us or call: 888-474-3555. Keep your business in Tampa, Florida safe from high wind, tornadoes, hurricanes, theft, vandalism and more with accordion shutters from Empire Construction & Development. This entry was posted on Monday, February 11th, 2019 at 6:09 pm	and is filed under Accordion shutters, Decorative Shutters, Hurricane Shutters, Storm Shutters. You can follow any responses to this entry through the RSS 2.0 feed. Both comments and pings are currently closed.